I didn't want to review this book. Given my efforts to keep my proportion of books reviewed to at least 30% women-written, and the fact that John Steinbeck already has a book on The List (in the Top Ten, no less), I didn't think he needed any more attention from me. However, as with Neverwhere and The Night Circus, I found myself pressed for time with a book club book to read, and so here we are. On the plus side, I had a great time reading East of Eden (over almost two months, yikes) and it's reignited an interest in Steinbeck that I didn't even know I had. I read Of Mice and Men in high school English class and remember very little about it besides the "vaseline glove" and the ending. I wasn't ready for how "woke" the content of East of Eden would be. Steinbeck is sort of telling his version of the Garden of Eden myth in this novel, except that of course the Bible story is five chapters long if you count generously (i.e. 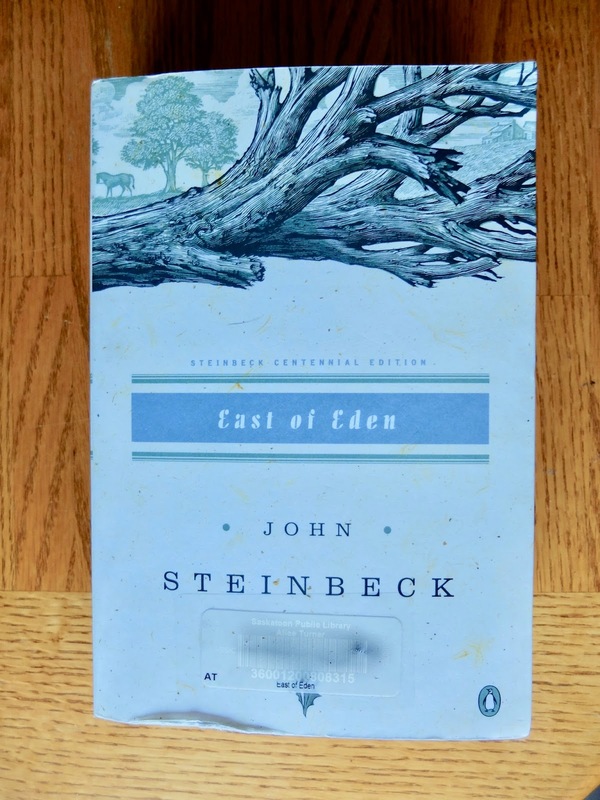 from the very beginning of the book of Genesis) and this is 601 pages long and features an entire subplot and framing device in which Steinbeck's own family appears through a rosy glass. Steinbeck is the unreliable narrator of his family's story and I'm not exactly sure why he decided to feature them here. If I had a wish with regard to this book, it would be for a whole other book along the lines of Angle of Repose featuring Samuel Hamilton (Steinbeck's maternal grandfather) et al. The Hamiltons made up many of my favourite parts of the book, but always felt like a distraction from the main story. They're never linked with that main story in a satisfying way. Anyway, back to the Garden of Eden. The connection between East of Eden and the Bible is tenuous at best, and as you might expect it mainly concerns fratricide. After a very long introduction, Adam Trask finally meets Cathy Ames, who is easily one of the best female villains I've encountered in literature, a psychopath par excellence. She gets Adam to marry her and then to her dismay, he brings her to California. Adam has money from an inheritance from his father, and he's blind in love with Cathy. Things go bad and Adam ends up with twin boys named Cal and Aron and Cathy living under an assumed name in the nearby town. I'm describing this all very badly. Typically I base my non-spoilery summaries on the first third of the book or thereabouts. If I did that in this case, I'd get into a lot of stuff with Adam's father and his brother and Cathy tormenting people in her hometown, which is all really rich backstory but has little to do with the actual events of the rest of the book. Sort of. And throughout all of this, I haven't even mentioned Lee, who is simultaneously the best and worst character in the whole thing. He starts off as a racial caricature whose dialogue is rendered in horrifying fashion. He then ends up revealing a rich inner life. Unfortunately this does become a bit too rich eventually. I appreciate the presence of a Chinese-American character in a Very American novel like this, but I would've preferred just a touch more subtlety from Steinbeck here. I really enjoyed the book, but found it hard to read very much of it at once, and I'm not exactly sure why. I would've preferred that it be chopped in two, perhaps a loose Salinas Valley duology. I recommend it, and I'm hoping that The Grapes of Wrath will be even better. When two men live together they usually maintain a kind of shabby neatness out of incipient rage at each other. Oh, strawberries don't taste as they used to and the thighs of women have lost their clutch! We have only one story. All novels, all poetry, are built on the neverending contest in ourselves of good and evil. And it occurs to me that evil must constantly respawn, while good, while virtue, is immortal. Vice has always a new fresh young face, while virtue is venerable as nothing else in the world is.